Showing 41 articles from December 4, 2013. Judge makes plea to commissioners: Repair courthouse! LOUISBURG — Franklin County commissioners agreed to move forward with long- and short-term plans to keep rain water from penetrating the courthouse roof — which has made working in the building almost unbearable for workers. The board made the commitments on Monday night, shortly after listening to Resident Superior Court Judge Robert Hobgood’s plea to make repairs. County’s gift: A diamond or lump of coal? FRANKLIN COUNTY — Franklin County got an early Christmas present. And a lump of coal. The state Department of Commerce announced that going into 2014, Franklin County will go from a Tier 3 rating to a Tier 2 rating. “It’s a good and bad situation,” County Economic Development Director Ronnie Goswick said of the tier ranking. 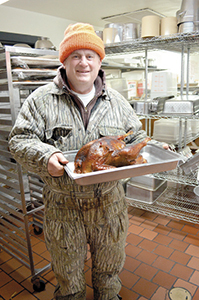 From the time ace turkey roaster Phillip Mueller (left) put the first of 26 turkeys on his grill shortly after dawn on Thanksgiving, the Louisburg College cafeteria became a bee hive of activity. 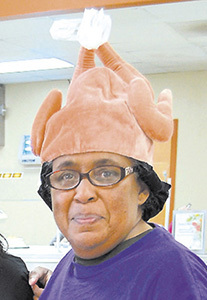 Volunteers scrambled to prepare a holiday feast to the less fortunate in the county and by the time turkey carvers Mona La Branche and Daniel Dalton began their work, the sides were ready and dessert tables laden with goodies. BUNN — A woman who was synonymous with Bunn, whether it was through her public service or lifelong ties to the community, has died. 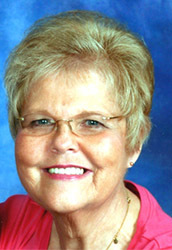 Jewel Medlin was 62 when she died suddenly in Georgia. “She and her family were a vital part of the Bunn community,” said Mayor Marsha Strawbridge, who came to serve on the town board shortly after Medlin’s service, but that didn’t stop the two from being lifelong friends. 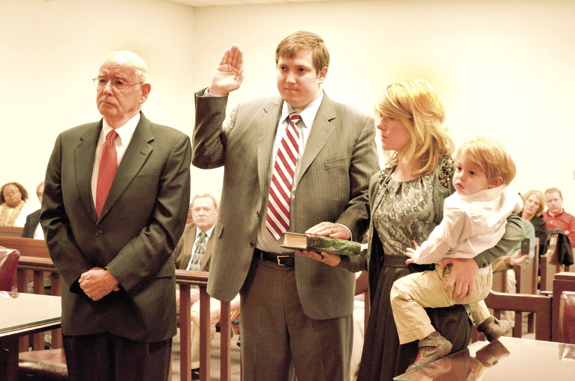 Attorney Christopher Wrenn, Jr., takes the oath as a new member of the North Carolina Bar from Resident Superior Court Judge Robert Hobgood (not shown) while his wife, Erin Biggio Wrenn, and their son, Henry, look on. At the left is local attorney Charles Davis who presented Wrenn to the court. Wrenn and his wife are both graduates of Louisburg High School, class of 2002, and he is joining the Louisburg practice of Davis, Sturges and Tomlinson. Granted, we’re a few days past Thanksgiving but it’s still a good time to say a special thank you to some folks who once again did a great job for us. Hopefully, virtually everyone with a mailing address in Franklin County got a free copy of The Franklin Times on the Wednesday before Thanksgiving, an annual tradition that we started to reach out to the county (and hopefully some new readers), plus give the local economy a huge boost at the same time. Why is it that we’re not even a little surprised that a roof repair estimated at under $150,000 has now spiraled past $1 million? And that’s not counting the as-yet-unestimated cost of an LED lighting project that may get added to the total! I don’t normally do this. But, the other day, I decided to look at Franklin County’s organizational chart. The question was raised as commissioners were discussing the poor state of the courthouse roof and the general neglect that’s being attributed to the poor overall state of county buildings, but I’ll get back to that later. On Monday, Nov. 18 I attended the Franklin County Board of Commissioners’ Meeting. That is common for me. 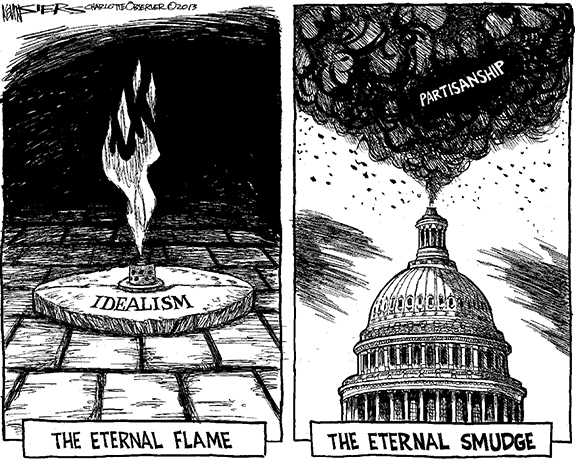 Unfortunately one of the topics of discussion was also familiar. One of the items on the agenda was a report by the North Carolina Department of Transportation. This particular report centered on the future of secondary roads in Franklin County, particularly unpaved ones. Many times the destination found is not the place one sets out to go to. Life and events have a way of not cooperating with our plans. Where this story has travelled is not where I thought it would end. 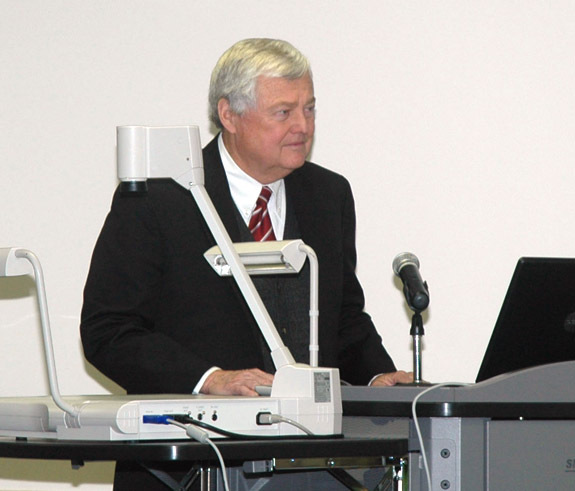 Many months ago I started to probe and report on Franklin County’s economic development. My intent was to do nothing more than change the discourse. Is Constitution debate really about suppression? We now have two reasons Franklin County Tea Party Republicans read the Constitution and only its first 10 amendments instead of all its amendments. My son’s home was broken into on Thanksgiving Day. There was extensive damage in his home and outside garage, and a number of items were stolen. The two deputies who arrived promptly are to be commended for the very professional way they handled the situation. I would like to extend my personal appreciation for a job well done. LOUISBURG - Ellen Barlogio King, 78, died Tuesday, Oct. 29, 2013 at the Clear Lake Hospital in Webster, Tex. Committal will be at the King family cemetery in Louisburg on Thursday, Dec. 5, at 1 p.m.
BUNN -- Most high school seniors might become a bit unnerved by the spotlight that shines on them during postseason all-star football games -- especially one that will be viewed by millions worldwide. 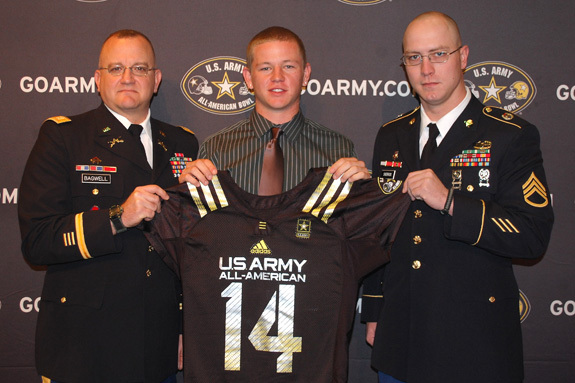 That type of attention doesn’t bother Bunn placekicker Freeman Jones. In fact, he relishes the opportunity to showcase his elite-level skills for an extensive audience. MALIK MAKES IT HAPPEN. 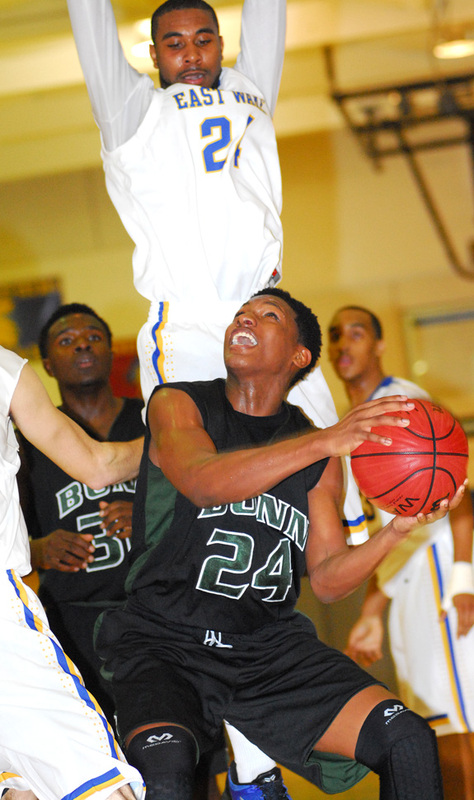 Bunn’s Malik Finley (left) drives toward the basket during Tuesday night’s road basketball showdown against East Wake HS. WENDELL -- An old coaching adage says that it’s much better to learn a lesson early in the season, as opposed to when it matters the most. 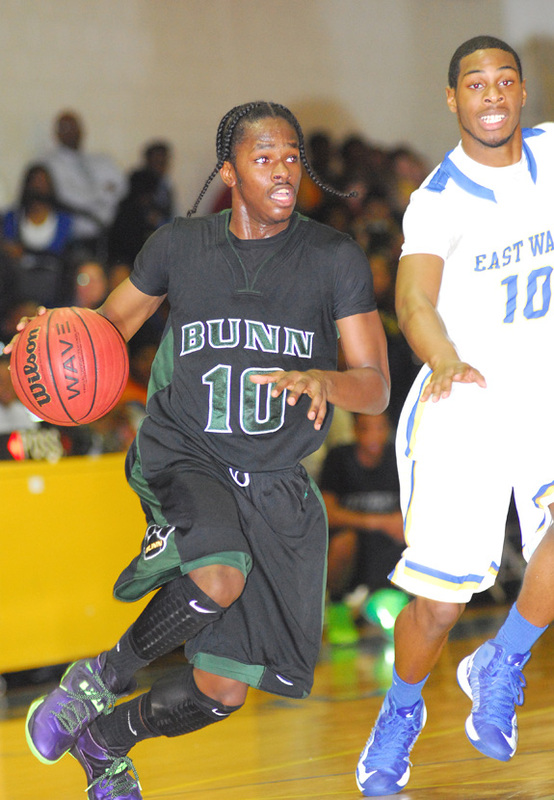 For the Bunn Wildcats, Tuesday’s heartbreaking road loss at East Wake will be one that is chalked up to experience -- and could very well make BHS a much better club as the campaign progresses. RUNNING THE SHOW. 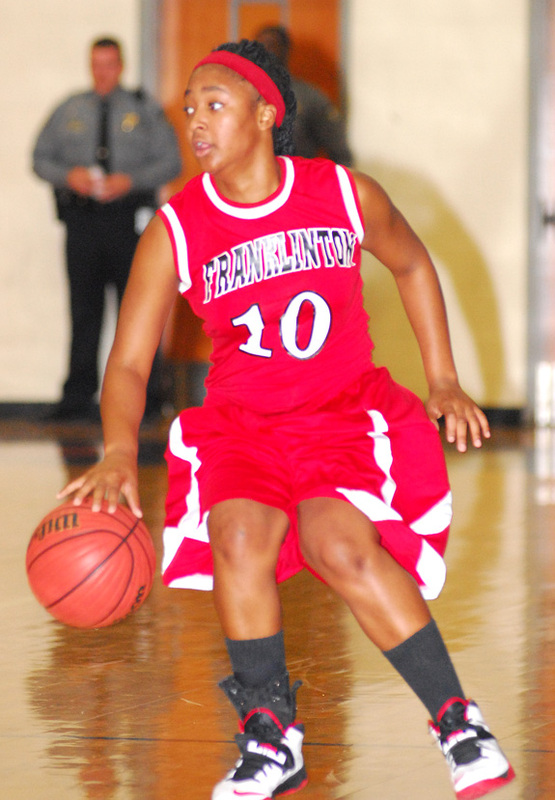 Franklinton’s Manisha Hawkins gets the Lady Rams’ offense into position during Monday night’s road game at Southern Lee. 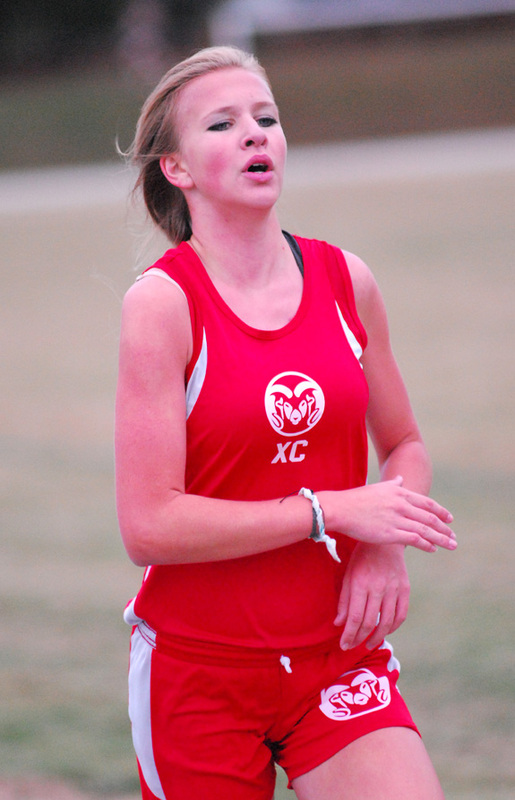 TRAMWAY -- A wealth of experience and talent has helped Franklinton’s Red Rams and Lady Rams both get off to strong starts to begin the 2013-14 basketball campaign. Franklinton’s boys are 3-2 overall, but are only five points from being undefeated thanks to tough losses against Chapel Hill and Southern Lee. FRANKLIN COUNTY -- The addition of powerhouses Durham School of Arts and North Carolina School of Science and Math meant that the running landscape would change dramatically in the Northern Carolina Conference during the 2013 season. That would prove to be the case as the two Durham schools swept the top honors from the NCC campaign. We all know how special the Louisburg-Bunn athletic rivalry is, but now the entire nation is finding out. USA Today High School Sports recently conducted a fan-voting poll, and Bunn-Louisburg won for the entire state of North Carolina. Franklin County’s intense rivalry now moves into regional competition, with a voting deadline at the end of the week. LOUISBURG -- Lancaster Funeral and Cremation Services in Louisburg is currently selling Fraser Fir Christmas Trees, with 100 percent of the proceeds to benefit The Miracle League of Franklin County. Garland and wreaths are also available. 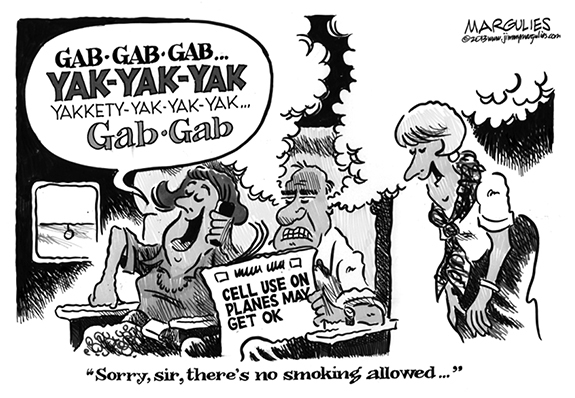 EXIT STRATEGY. Louisburg’s Leonardo Carachure tries to escape the hold of a Rocky Mount wrestler during last Wednesday’s I-95 Duals Tourney at Northern Nash HS. 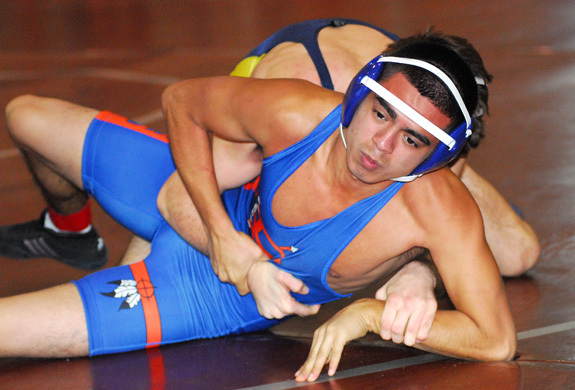 RED OAK -- More formidable competition awaited the Louisburg High School wrestling team when the Warriors headed to Northern Nash last Wednesday for the annual I-95 Duals. The customary pre-holiday tradition pitted the Warriors against some tough foes, beginning with a date against long-time powerhouse Rocky Mount. MT. OLIVE -- The #9 Louisburg College Hurricanes men’s basketball team responded to a loss at Brunswick CC with a 108-44 thrashing of Mt. Olive College’s junior varsity team last Monday night in Wayne County. The Hurricanes outscored the Trojans 51-26 in the first half and the LC men stepped things up in the second frame as they topped MOC, 57-18, en route to their eighth win of 2013. HENDERSON -- The Vance-Granville Community College men’s basketball team is 0-5 to start the 2013-2014 season -- the first under new head coach Michael Woody -- after getting straight to work on a tough schedule in November. On Nov. 6, the VGCC Vanguards opened the regular season at home by hosting the Eagles from Wake Technical Community College. LOUISBURG -- The Mid-Atlantic Championship Wrestling Clash of Champions will be held this Saturday at Taylor Center on the campus of Louisburg College. Doors will open at 7 p.m., with the first match slated for 8 p.m.
Bunn at Pittsboro Northwood 6 p.m.
Durham Arts at Franklinton 6 p.m.
SWIPE MEET. 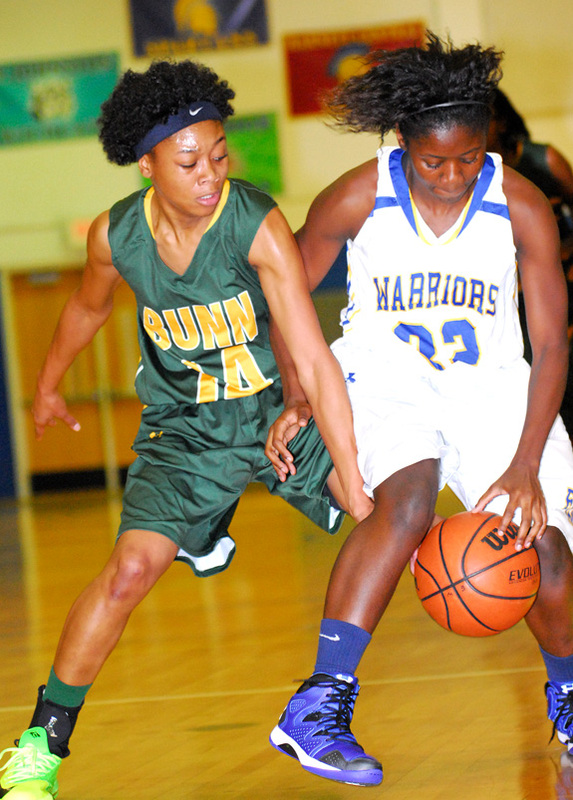 Bunn’s Tainasha Vines (left) tries to come up with a steal during Tuesday’s game at East Wake HS. 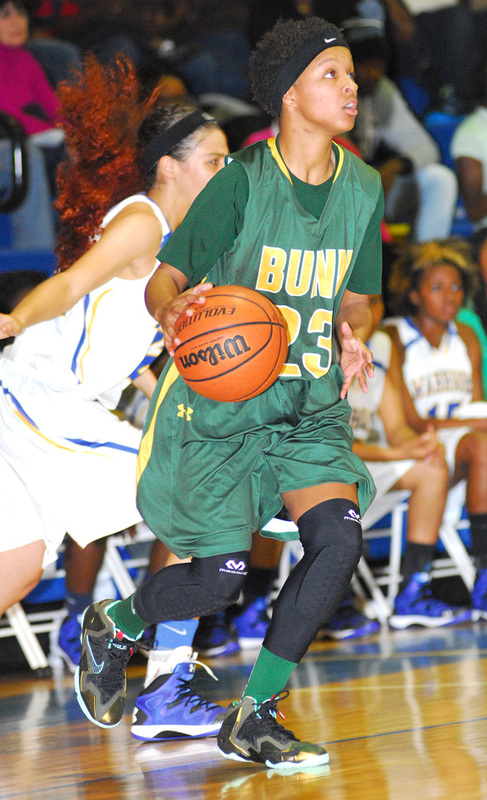 WENDELL -- Matt Keith’s brief stint as an assistant coach for the Bunn High School girls basketball program could provide a wealth of long-term benefits. When Keith moved over to the girls squad last winter after spending seven seasons as a boys assistant, he didn’t imagine that, one year later, he would be the club’s head coach. 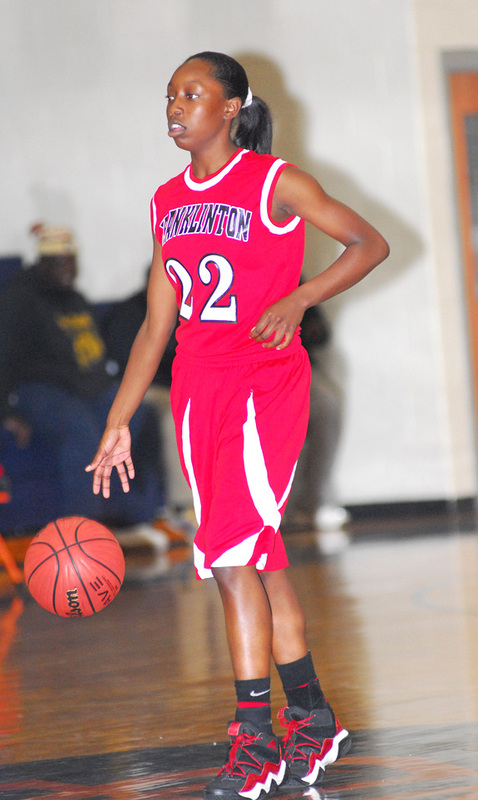 Guard Diesha Davis is among the key returnees this season for the Franklinton High School girls basketball squad. Despite being guarded heavily, Bunn’s Aaron Simmons (with ball) scores in the paint for the Wildcats during Tuesday night’s road basketball matchup at backyard rival East Wake. 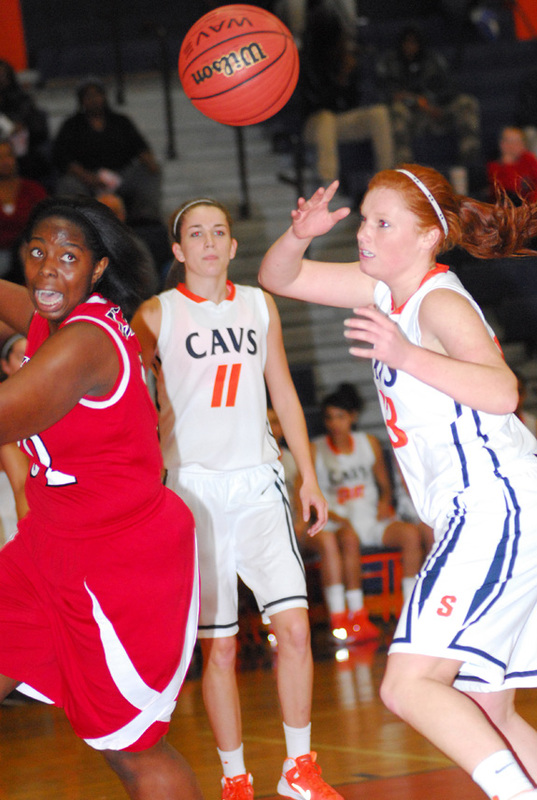 After shining as a freshman last season, even more will be expected this year from BHS sophomore basketball standout Precious Walker. Franklinton’s Alexus Coles (left) watches a loose ball bounce away during the Lady Rams’ road setback Monday night against the Lady Cavs. 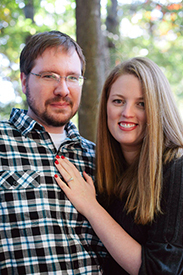 Mike and Linnea Anderson of Louisburg announce the engagement of their daughter, Beth Noel Anderson, to Daniel Coleman Dalton, son of Ronald and Sarracia Dalton of Ringgold, Va. An April 12, 2014 wedding is planned. The following Franklin County students were named to the Kerr-Vance Honor Roll for the first- quarter grading period. DURHAM — The oldest and largest sustainable agriculture organization in the Southeast recognized a Franklin County cooperative extension agent as its Agent/Educator of the Year. The Carolina Farm Stewardship Association bestowed the honor upon Martha Mobley during an awards banquet on Nov. 16. Mobley was nominated by her peers. Sheriff’s deputies arrested a Franklinton man on charges that he tried to rob a grocery store with a shotgun. Jimmy C. Carpenter, 31, was charged with robbery with a dangerous weapon and attempted robbery with a dangerous weapon. According to the report by Dep. Stephanie Anders, Carpenter entered Floyd’s grocery on N.C. 98 just after 10 p.m. on Dec. 3 and pulled out a shotgun and demanded money from the proprietor — Juan Alshadady. 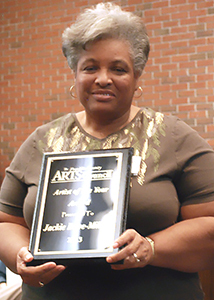 Jackie Dove-Miller and Kim Young were named 2013 Artists of the Year when Franklin County Arts Council held its annual general meeting recently in the Benson Chapel Building on the campus of Louisburg College. Dove-Miller is a published poet and a spoken word artist, well known throughout the state. She is a member of both the FCAC Writers Guild and the FCAC Photographers Guild. The annual Coats for Christmas drive continues with its organizer, Wayne Champion. The Village Cleaners in Louisburg provides cleaning for the coats and employees, from left, Esperanza Pahuamba, Reyna Romero and Johnathan Pahuamba, join Champion at one of the drop-off sites. Coats will be given to those in need through Safe Space, senior citizens centers, Care ‘n Share and churches. The Franklin County Social Services Angel Tree has returned to a familiar site where it was banned last year. 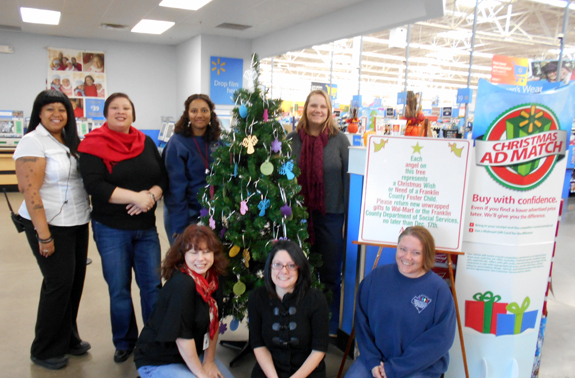 Shoppers at Walmart can pull a name from the tree and shop for someone this holiday season. The Angel Tree holds the wish list of 53 children in the custody of the Department of Social Services. Besides the tree, DSS is also seeking sponsors for Christmas who will purchase items for families, children, and the elderly.